Padmabhushan Professor Dr. Jacob Chandy, born on January 23, 1910, is no more with us physically from June 23, 2007. However, he shall remain in our hearts forever. There are individuals and institutions among us but there are a few individuals who are not only eminent individuals but are also synonymous with institutions. Dr. Jacob Chandy was one such individual. In the 1950s and ′60s the mention of neurological sciences or medical education brought the image of Dr. Jacob Chandy to one's mind. He started the first department of Neurological Sciences in India in 1949 at the Christian Medical College, Vellore. He was the founder President of the Neurological Society of India. He was a founder member of the National Academy of Medical Sciences and the Indian Association for the Advancement of Medical Education, to mention just a few. In recognition of his significant services in Neurological Sciences related to patient care, education and research he was awarded the Padmabhushan by the Government of India. Internationally, he received honors from the American College of Surgeons, World Federation of Neurosurgical Societies, the World Health Organization and the World Council of Churches. Dr. Jacob Chandy will mostly be remembered for his role in the development of Neurological Sciences in India. The history of the development of Neurological Sciences in India is well known. Therefore, I shall not go into it, but shall mention a few principles that he and his team at the Christian Medical College found very useful. The first department of Cardiothoracic Surgery in India was started at the Christian Medical College, Vellore in 1948 by Dr. R H Betts. Soon after, in 1949, Dr. Jacob Chandy started the department of Neurology and Neurosurgery. At that time there was tremendous pressure from the administration of the Christian Medical College for these disciplines to be put under general medicine and general surgery. Both these professors refused the request and so independent departments were created which helped in the unhindered development of these departments. However, they fully cooperated with the general medicine and general surgery departments, particularly in teaching the undergraduates and postgraduates. In the ′50s, in many other centers in India, Neurology and Neurosurgery were put under General Medicine and General Surgery which hindered the effective growth of these specialties to some extent. The lesson learned was "Be independent but be fully cooperative". The development of Neurological Sciences as an integrated department was an idea that Dr. Jacob Chandy inherited from the Montreal Neurological Institute (MNI), Canada. This was not a popular idea in India at that time. It was Dr. Chandy's personality and foresight that made the system function in a smooth manner. The individual disciplines had the full freedom of functioning under unit heads. The head of the department of Neurological Sciences, a rotating job every five years, coordinated the work and the development process. The department which started in 1949 with Neurology and Neurosurgery, progressively incorporated Neurochemistry, Neurophysiology, Neuropathology and Neuro Radiology. Some of the major institutes in our country follow this pattern. Credit should go to Dr. Jacob Chandy for initiating this idea in India. The formation of the Neurological Society of India in 1951 as a composite group of Neuroscientists is also an indication of the desire of our first generation predecessors to nurture the idea of composite and cooperative development of Neurological Sciences. The establishment of a new clinical discipline was not an easy task. Clinical assistants, nurses, and technicians had to be trained and the work had to be personally supervised. The inadequate infrastructure available had to be utilized effectively. Improvisation often became necessary. The work for the day had to be finished. This very often meant an 18h-working day. Dr. Baldev Singh joined Dr. Jacob Chandy in 1950 as fulltime Neurologist. He fully supplemented and complemented Dr. Chandy′s initial work and established electrophysiology. They worked together very harmoniously which boosted the morale of the juniors. Some of us who worked with them in the early years learned the value of togetherness, hard work, persistence, honesty and integrity. The greatest lesson we learned was that great things can be achieved by starting with small things and that it is important to get started. Another reason for Dr. Jacob Chandy′s success in developing neurological sciences in India was his decision to choose Christian Medial College, Vellore for his lifetime work. While at Montreal and later at Chicago he had many offers from various organizations in India. He chose Vellore because of its religious commitment and its philosophy of fulltime institutional work and sharing the expertise with disadvantaged sections of the society although at a financial disadvantage to oneself. At that time most of the senior people in medical colleges elsewhere functioned only part time in the institution because of their busy private practice, which gave them little time for effective development of clinical sciences, teaching and research. Therefore, progress came slowly at those medical colleges, although personally most of them were brilliant people. In 1953 there were only four functioning Neurological and Neurosurgical centers in the country - Vellore, Madras (Chennai), Bombay (Mumbai) and Calcutta (Kolkata). Recognizing the need for expansion of services in the country, Dr. Chandy instituted a two-year residency training program for Neurosurgery in 1954, preferably for doctors who had completed the postgraduate qualification in general surgery. Preference was given to candidates who had official sponsoring from institutions. The first three candidates were Dr. RN Roy (Calcutta), Dr Gajendra Sinh (Bombay) and Dr. RS Dharker (Gwalior), who after receiving the training went back to their respective areas and started new departments or enhanced the existing programs. Such a course was started in Madras Medical College by Dr. B. Ramamurti in 1955. Sensing the desirability of university certification the M.S. Neurosurgery program (later changed to M.Ch) was started by the Madras University at the Christian Medical College, Vellore under Dr. Jacob Chandy in 1958 and at the Madras Medical College under Dr. B Ramamurti in 1959. In 1959, the Christian Medical College Vellore was also recognized by the Government of India as one of the approved institutes for the training of government-sponsored candidates from the center and the states. Therefore, a large number of government medical colleges and some other governmental organizations such as Defense were staffed by Neurosurgeons trained at Vellore. The A D.M. 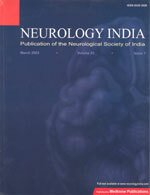 program in Neurology was started by the Madras University simultaneously at the Christian Medical College, Vellore and at the Madras Medical College in 1966. The development of this university program became possible because of the combined efforts of Dr. Jacob Chandy and Dr. B Ramamurti. The Christian Medical College, Vellore had adopted the residency system, similar to the ones in the US and Canada, for the training of their postgraduates as early as 1950. This meant that the postgraduates had to be in residence, available to the department whenever needed and without any outside professional commitments. They had theoretical and practical training in the clinical area with progressive responsibilities so that they were competent clinicians after training and certification. In the early ′50s India had practiced the British system of postgraduate certification through an examination without a full residency program. Dr. Jacob Chandy had a good relationship with the Madras University and other Universities and the Ministry of Health and the ICMR at New Delhi. Being on various committees on medical education he was slowly able to influence universities and government agencies to implement a residency program for postgraduate studies, particularly so, in Neurology and Neurosurgery. To quote Dr. Jacob Chandy from his book Reminiscences and Reflections - "Years later when CMC became a leading Medical Institute I was asked to help the All India Institute of Medical Sciences as the Chairman of their Academic Council for a term. I had to help in the development of other institutions as well; for example in Pondicherry, Goa and also to get involved in several committees and discussions. But I had to keep in mind always that I was representing CMC and its ideas". Padmabhushan Professor Dr. Jacob Chandy was the first of the first generation Neurologists, Neurosurgeons and Neuroscientists. He was the last of this group to leave us at the age of 97. Till three days before he passed away his memory, intelligence and reasoning were intact. In retirement he enjoyed watching the development of Neurological Sciences in India. May God rest his soul in peace.